DUOLINE Technologies, a global leader in fiberglass internal lining systems for protecting oilfield tubulars, introduced the D-350 product line in 2012. D- 350 provides reliable corrosion protection of steel tubulars with temperature resistance up to 350°F/177°C. D-350 is installable with most API & Premium connections, ranging from sizes of 2-3/8” thru 13-3/8”. DUOLINE D-350 may be installed in threaded oilfield tubular goods with nearly any connection option. There are a few general "rules of thumb" regarding connection and connection protection devices for DUOLINE. API threaded connections generally employ the elastomeric DUOLINE corrosion barrier ring (CBR) that has over 50 years of field history. The elastomeric ring manufactured from a high performance rubber compound ensures proper corrosion protection to the vulnerable connection area. 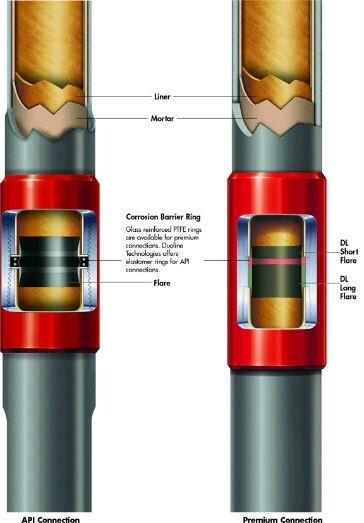 Premium connections employ a "T" shaped PTFE CBR with either the DL-Ring system, or the "FGL" variation to common premium threads. Duoline-20 and Duoline-350, manufactured by DUOLINE Technologies, are filament-wound, fiberglass-reinforced epoxy liners that reliably beat corrosion. Since 1964, more than 100 million feet of Duoline liners have been successfully installed worldwide as a more robust alternative to plastic coatings, and as a high-performance, high-value, cost-effective alternative to Corrosion Resistant Alloys.